We showed up at the school where the event start/finish was, and there were cyclists everywhere; and every kind of cyclist you can think of (or maybe haven’t thought of). 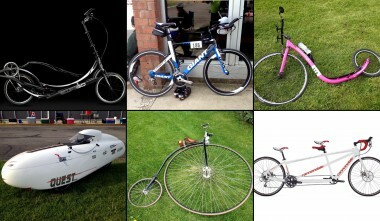 I’m pretty used to getting funny looks riding around on the Elliptigo, but check out some of the other classifications of bikes that were represented. There are two stages to this event. First, there is the 50.5 mile loop. Once that is completed, it’s on to the 7 mile loop, which you pretty much do as many times as you can until either time, or your energy, runs out. 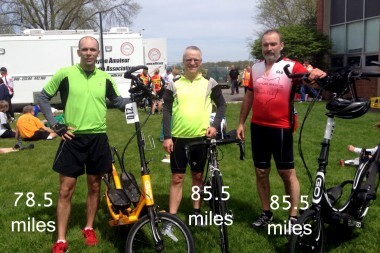 I figured that I would stick with my dad and Mike through the 50 mile loop, and then head off and do my own thing. At last that was the plan. The wind was nasty on Saturday; blowing from the Southeast anywhere from 13-18 mph. It seemed to get worse throughout the day. The horn went off at 8:30, and we were off! To be honest, my dad took off at a much quicker pace than I was expecting. With the thought of 25 miles of headwind to look forward to, I was thinking of easing into the ride and conserving some energy. My race strategy pretty much went “bye bye” about 30 seconds into the ride. I recall looking at my watch 10 minutes in saying, “10 minutes down, 5 hours and 50 minutes to go”. If that seems like a long time, that’s because it is! It was at about mile 28 that we finally took a left hand turn that put the wind at our backs, allowing us to ride 20 mph for long stretches of road. Finally, after good-sized hill, we were finishing up the first loop. I had to give my feet and back a quick rest, mow down a cliff bar and some Hammer Gel, and then I was back on the road for my first lap on the 7 mile loop. My dad was nowhere to be found. He took a much shorter break than me , and got a bit of a jump on. At this point of the day, I was beginning to realize that my father was no joke (never thought he was), and that the chances of me beating his mileage were slim to none, and my chances of matching his miles weren’t much better. Now, anyone that knows me can attest to how competitive I am. Quite frankly, at this point I just didn’t care. I just wanted to do my best, and try to reach my goal of 80 miles. One 7 mile lap down, and I would have rather kept riding, but my body was yelling at my to stop. My feet were feeling numb, and my mid-back was in a lot of pain. I mustered up the strength to get back out and do another mile, stopped to rest again, and did another. Each subsequent lap got harder and harder than the one before (unlike my friend Mike who said his final lap he felt “peppy”). I truly wanted to stop at 71.5 miles. 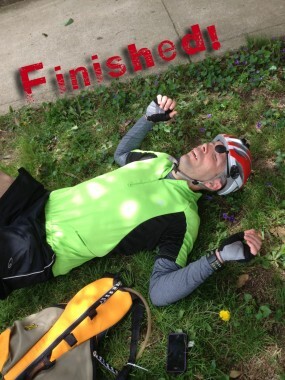 There were about 35 minutes left, and I knew that if I were to reach my goal I’d have to get going; and soon! I don’t know if I’ve ever pushed through pain as much as I did that last 7 miles, but I was able to finish that lap with 2 minutes to spare. I accepted the fact that 2 minutes just wasn’t enough time to get in another 1.5 miles to reach my goal, and that was just going to have to be ok.
78.5 miles. So close, yet so far away. That last mile and a half might as well have been another 20 miles away. Even if I had enough time, I simply don’t know if I could have done it. So, how did my father and Mike fare? They both came in with a total of 85.5 miles; one lap further than me. My dad lapped me with 3.5 miles to go, and Mike did the same about two miles later. Oddly enough, all three of us medaled! Mike won 2nd place in the bicycle category for his age group. Dad won first place in the Elliptigo category for his age group, and I won first for my age group as well. Ironically, my father and I were the only two competing in the Ellliptigo division, so I’m not going to feel too good about that medal. I do however feel good about my effort. I know that I pushed myself harder than I probably ever had, and who knows, maybe I’ll be dum b enough to try and do better next year.